Synthetic aperture radars (SAR) are the only instruments in space that can simultaneously provide direct measurements of surface current, wave and wind fields, and their products are used operationally to detect ships and oil spills; to track propagation of swell fields across ocean basins; and to monitor ice motions. At present, there is no facility in southern Africa for processing or disseminating SAR products to the marine community. Synthetic Aperture Radar for Africa (SAR-Africa) is an initiative which aims to develop African capacity for the processing of satellite SAR products to pursue oceanographic research and promote operational applications. In November 2008, the first SAR-Africa workshop was held at the University of Cape Town, where SAR applications, data processing and data limitations were reviewed. A number of presentations highlighted that the coast and shelf seas of southern Africa are an ideal area in which to test applications and further the development of SAR products. The Agulhas Current ecosystem, in particular, supports a high degree of biodiversity and endemism and a range of ecologically-sensitive environments, such as mangroves and coral reefs. Major economic activities along the continental shelf of the Agulhas Current include fishing, oil and mineral exploration as well as intense shipping traffic, with the transportof crude oil from the Middle East to Europe. The Agulhas Current flows along the continental shelf of southern Africa, and is the most intense western boundary current of the southern hemisphere. It transports large volumes of warm water southwards and has an average transport of 70 SV, with typical current velocities of 11.5 m s1. The current, which is affectedby a wide range of meso and sub-mesoscale processes such as rings, eddies, filaments and plumes,1 is an important component of the global thermohaline circulation2 and has a significant impact on the overlying atmosphere.35 The highly variable and complex circulation associated with the current provides an ideal natural laboratory for testing and developing remote sensing products. In South Africa, past efforts in marine remote sensing developments have focused on providing ocean colour and sea-surface temperature data to the marine community. These data, while extremely useful to ocean users, do not provide information on the surface dynamical properties of the ocean and are often limited by the ubiquitous presence of clouds in the region. While satellite altimetry products have also been used extensively in the Agulhas Current region to characterise the oceanography of the system and to study wave/current interactions,6 the use of altimetry in coastal regions poses serious challenges and often results in the loss of data near the shore.7 Synthetic aperture radars are the only instruments that can simultaneously sample the wave, current and wind fields from space. SAR instruments are not affected by atmospheric conditions or night and day variations, and are able to image from the open ocean to the coast at a high resolution (to the order of 5 km to 30 m). Developing SAR capability in South Africa should complement current and past remote sensing capacity, and potentially offers a whole range of new data products specifically suited to monitoring the physical environment. For example, high-resolution wind fields (of the order of 1 km) can be derived from SAR data products. Those high-resolution wind datasets could be used for the study of local atmospheric systems such as coastal lows, and their impact on the oceanic and coastal regions. The availability of data on high-resolution synoptic winds in South Africa could be very important, as winds are a major driving mechanism for many of the coastal systems in the region. 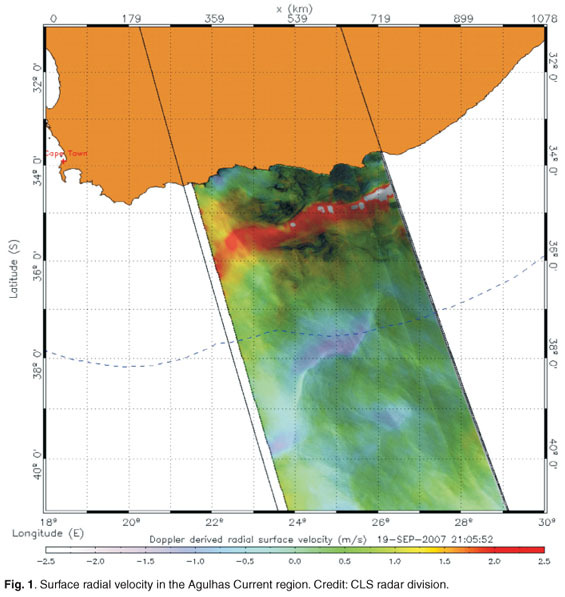 The direct surface velocity measurements from SAR involves innovative use of the Doppler centroid shift and represents a significant breakthrough for oceanographers, as it could bring new insights into the upper ocean dynamics in the Agulhas Current. This is illustrated in Fig. 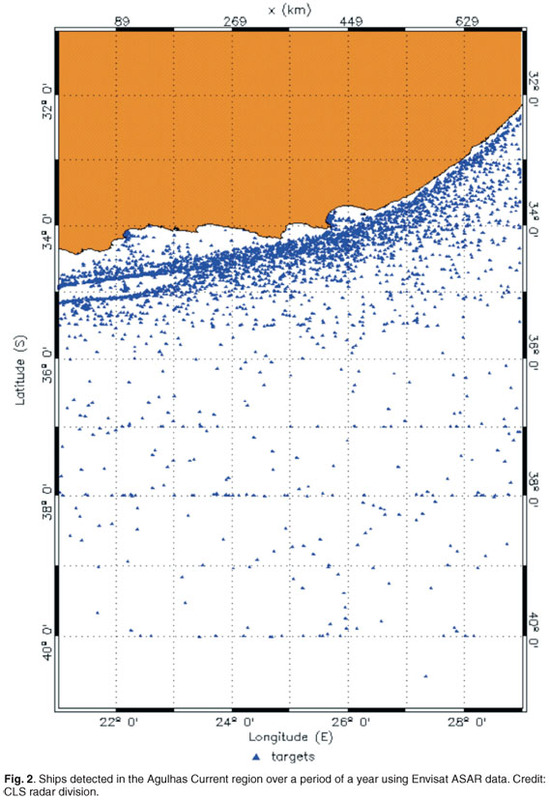 1, where the 'river-like' expressions of the Agulhas Current and the Return Current are clearly visible in the range-directed surface velocity field with a speed reaching above 2 m s1. In addition, there are several more immediate practical applications. The Agulhas Current is known for the destructive effect of its giant waves on passing ships, but the capacity of SAR instruments to produce concurrent estimation of current and wave fields could help further our understanding of wave/current interaction processes. As the current lies on an important shipping route for the transport of crude oil from the Middle East to Europe and the Americas, oil tankers navigating around Cape Agulhas can be exposed to extreme weather and sea conditions, which greatly increase the risk of major marine pollution. SAR products are routinely used around the world to detect and map oil spills. Coupled with vessel-monitoring systems, SAR's capacity to detect vessels at sea could be used effectively to take action against illegal fishing and illegal oil dumping, or to monitor traffic at sea and ensure the safety of sea routes. Fig. 2 shows ships detected in the Agulhas Current region using one year of SAR imagery. Such imaging capacity could be used to help define safer shipping routes in order to avoid extreme events such as rogue waves, which often occur on the landward border of the Agulhas Current.6 Finally, the ability of SAR instruments to simultaneously map wind, wave and current wind fields could be extremely useful for the provision of accurate sea state bulletins. Over the course of 2009, financial support for the development of SAR products will be actively sought, prioritising research involving postgraduate projects and assessing operational implementation. The validation of SAR products against in situ observations is essential for the successful implementation of a SAR research and operational capacity, so efforts will be made to put in place a dedicated SAR field validation campaign. A website has been established to report on any activities related to the SAR-Africa project (http://www.afro-sea.org.za/mrsu/sarAfrica).